Leveling Holy | Nobody told me this would take so long. Nobody told me this would take so long. Quick post to note I’ve updated my Weak Auras page and changed the storage and links over to Pastebin. With the release of Mist of Pandaria I made the migration to WeakAuras like many people. The expected upgrade to PowerAuras (MoP compatible here) wasn’t working out at the time and I made the transition rather than trying the upgrade during Beta and switching back to PA’s MoP-ified v4. Generally speaking, the two addons do the same thing. I am not entirely used to WeakAuras but I recognize some areas where it offers enhanced capabilities. My own PowerAuras strings may still work for the updated version 4 of the addon but are no longer being maintained. I have now posted my WeakAuras strings which provide a very similar setup. I will continue to maintain that page and update it for future encounters as well. My original post on mana regeneration for Mists of Pandaria was focused on level 90. I try to post content that is useful beyond today, but the apparent interest in the new mechanics told me many people want something useful for the time remaining before they run off to punch monkeys and bunnies. 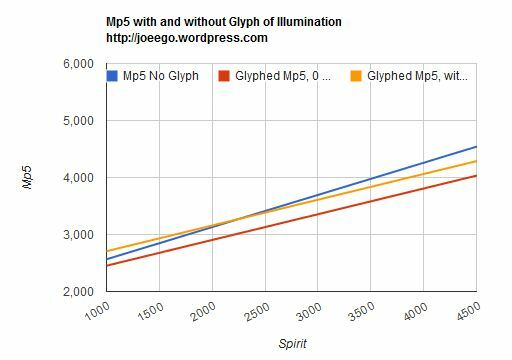 So let’s look at mana regeneration again and play with the math for the Glyph of Illumination as it applies to level 85. Level 85 casters and healers have 100,000 mana with very few exceptions. If you find yourself running out of mana then you’re either spending too much or you lack sufficient regeneration, which now means you lack sufficient Spirit. Just like your finances, always look at your spending first. Are your teammates taking unnecessary damage? Are you casting efficient spells or setting new records for overhealing? Are you using your cooldowns, which let you save mana when you do not need them for output? Are you using your regeneration spells frequently and appropriately? Are you selecting appropriate talents and glyphs to fit your play style and the expected encounter? Have you reevaluated your stat priorities? Haste break pionts have changed and more Crit or Mastery could increase the efficiency of your healing. For Paladins, spells are now more expensive when compared to other healers. Paying this cost ahead of time means Holy Power spells are not really free. Paladins must choose to pay more or less for each point, magnifying the effects of good and bad decisions throughout a fight. The way you spend your mana will be greatly affected by your familiarity with the changes to your class. Simple things, like broken addons not alerting you to Divine Plea coming off cooldown, can also have a big effect. When considering your income, reevaluate the following aspects of your character. Reforging: Make sure you’re not sacrificing any Spirit. Discipline Priests were noted for their low Spirit requirements. Enchants: Heartsong provides a great deal of Spirit while Power Torrent is purely a buff to output. Gear: Change to regen trinkets and consider replacing other pieces which did not come with Spirit already. The two-piece bonus from Tier 12 is a strong option for healers, though Blizzard may ‘fix’ this later. Buffs: It’s easy to forget, but there is food and a flask which increases your Spirit. The math for level 90 directly applies to level 85. The major differences are the details of maximum mana and available gear. In my last post I described a situation where lower gear levels (with lower Spirit) could make the glyph a good choice but eventually it would be outgrown. For the next few weeks we get to experience how the glyph could perform at Tier 16 gear levels. The length, in seconds, of that fight. Recount or World of Logs provide easy ways to find this information. The table and graph will update and give you a verdict. For example, here is what the graph looks like based on a fight lasting 3:36 where I cast 25 Shocks at 44% crit rate. I need to cast Holy Shock more frequently. Glyph of Illumination is a horrible, horrible, horrible choice for me because I have nearly 5,000 Spirit during a raid. You might say I have too much Spirit but I’d call you a big meanie who hates Spirit. And freedom. After you do the same analysis for your own character, the simple thing to do is to wash our hands and be done with it. If you’re within a few hundred Spirit of where the crossover occurs then his would be wrong. Though Spirit is the strongest regen stat, it is worth your time to fully investigate the potential for Crit as well. That’s why you’re here, right? Head over to chardev, load up your Paladin and maximize your Spirit followed by Crit. Find the difference in Crit percentage from the WoW Armory and your changes at chardev. Increase the crit rate found from your combat logs by this difference. The first graphing process told you if the glyph was a good choice right now. This second graphing process tells you if increasing your Crit will make the glyph a good choice. Based on my first example, if the crit rate were 10% higher it would push the crossover point to 2,700 Spirit. I don’t want to sound enthusiastic about a glyph which looks downright horrible, but I am intrigued by the potential of Crit doing double duty as a regen and throughput stat. Hopefully this will prove useful if only to warn people away from a bad choice. Or maybe this will help convince Blizzard of the need to change or remove this glyph. Last month I mentioned I’d be sitting in on a Holy Paladin roundtable. We had a great time recording. You can listen to the show here, or find it on iTunes. With Megacode hosting, we had a very symmetrical arrangement. Two Americans and two Canadians. Two humans and two elves. Two males and two females. It was eerie. So eerie, one of our friends created artwork to accompany the show. Thanks, Walks! The Holding Hands achievement during Hagara in Dragon Soul can be one of the most frustrating things for a 25-man raid to complete. Originally, we tried several times with a long snake-like path. We found the lightning would occasionally refuse to jump between some players, which seemed to fail the achievement when we maneuvered players closer to force a jump. Even if it works, the setup is time consuming and the raid has to survive extremely high damage. Then we found videos of the achievement with a simple line of elbow-to-elbow players. Ridiculously simple, stupidly easy, and still not 100% reliable. It took 3 tries for us to complete the achievement twice. It’s issues like this that remind me why I’ve never been much for the Meta mounts and achievements. Megacode will be hosting a Holy Paladin roundtable next week with several socially active players. I’ll be joining him as one of four “experts” on the panel. Questions can be sent in to Healingspec@gmail.com. Maybe you’ve got tough questions. What stat(s) will be prioritized in Mists of Pandaria? Will we be the worst healers in tier 14? Why, oh why, did we lose our auras? Or perhaps you’re just a troll. Why did I ever think Mastery is any good? If Kurn likes jumping through hoops, why doesn’t she love achievements? Will Ophelie ever blog about WoW on her WoW blog again? How much crap does Chase get from commenters at WoW Insider? Send your questions and we’ll do our very best to provide answers. I’ll verbally italicize as many of mine as possible. Well, I placed emphasis on only the important stuff. I had a lot of fun, even if I did have to leave a little early for lunch with my family. Chase couldn’t make it, but we persevered. The show is now published here (direct link). Note: This post focuses on level 90. See here for further discussion on level 85. Note 2: The level 90 spreadsheet has been updated to account for a potential change to the 4-piece t14 bonus and expanded for higher Spirit values. You may not have edit rights, but you can always save your own copy from the File menu. The spreadsheet, as usual, is found here. With Mists of Pandaria (MoP) in Public Beta and the pre-expansion 5.0 PTR going live soon, our friendly neighborhood theorycrafters are swarming about trying to determine stat weights, rating conversions, and rotations. In the healing realm we are especially concerned with mana regeneration. Intellect will only increase the power of spells and no longer increase the size of a caster’s mana pool. All casters have the same amount of mana at any given level. At level 90 this is 300,000. With very few exceptions, nothing will change a caster’s maximum mana. Gear upgrades, in particular, have no effect on mana levels. Spell costs are still calculated from base mana, but caster-only classes have 300,000 base mana while Paladins and others have 60,000. Classes without modifiers appear to have wildly cheaper spells but end up about the same. See Flash of Light at 37.8% of base mana while Flash Heal is at 6.6%. The Paladin’s Holy Insight is one of the new specialization-specific grab bag spells used by tanks and healers in Mists of Pandaria. In Vanilla terms it would have been at least four different multi-point talents. In MoP it comes free when we choose Holy. It includes increased healing power, mana pool size, and combat mana regeneration as well as additional Hit chance for our damaging spells. Building off Derevka’s work at Tales of a Priest, we have the formula for Holy Paladin mana regeneration in Mists of Pandaria as expressed in the common terms of Mana per 5 seconds (Mp5). This can be used to calculate the value of gear and buffs. It can also be used to compare non-Spirit regen mechanics, as Derevka also did here for racial bonuses. We want to cast Holy Shock often because it is a mana efficient heal and generates Holy Power for more mana-free healing. Shock crits proc Infusion of Light for faster heals. Shock has a built in 25% crit bonus. Can something we’re already doing also increase our mana regeneration or is this glyph just a bad idea? Use the Spirit value from our character sheet and be sure to include stacking (Solace, HoU, etc), periodic (Heartsong, etc), and raid buffs (food, flask, etc). Figure Shocks per Minute from combat logs or we can start with an estimate of 8. The maximum possible is 10. The maximum with the 4-piece bonus for tier 14 is 12. Shock Crit% will be our character sheet’s Crit% (including other buffs as we did for Spirit) plus 25% built in to Holy Shock. We can plot the mana returns, both with and without the glyph, onto a chart for a comparison based on selected stats. This helps us determine if the Glyph of Illumination is a good choice. I have the calculations displayed on the first tab of this spreadsheet and we’ll look at one example of what we might expect early in tier 14 raid progression by estimating 8 Shocks per minute and 35% Crit. The most important information shown by this graph is the steeper slope of 50% Holy Insight means the glyph will always be outgeared as we increase our Spirit. 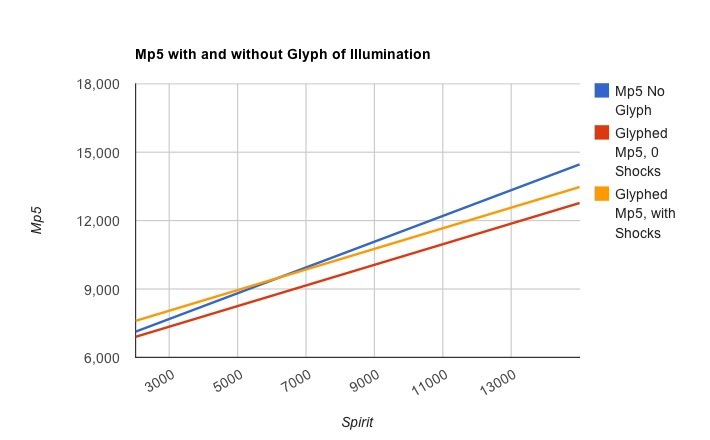 In this example the yellow line of our expected regen with the glyph is outperformed starting between 6,000 and 7,000 Spirit. Wowhead’s character profiler easily produces a character with over 7,000 Spirit when equipped with tier 14 Heroic Dungeon and Raid Finder equipment. The usefulness of the glyph appears limited to stat ranges seen while leveling and gearing up through 5-man dungeons. To avoid testing hundreds of stat combinations we can make our formulas equal to each other, do a little algebra, and create something more useful. 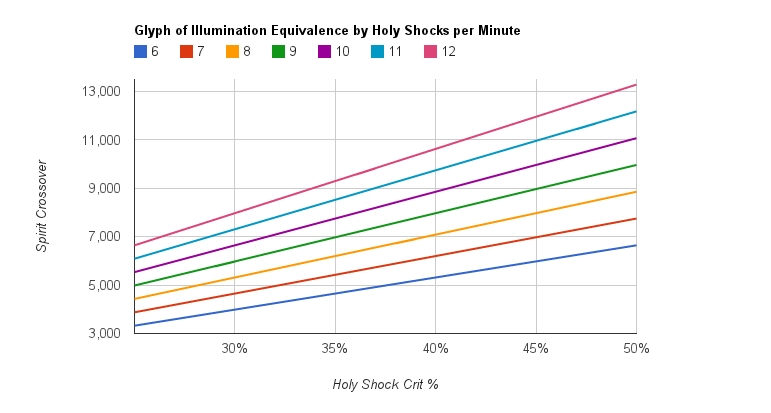 Now we can create a graph for varying numbers of Holy Shocks per minute. I’ve calculated all of this on the second tab of this spreadsheet where we can also experiment with non-integer values for casts per minute which might better approximate actual encounters. Here is a graph showing several cast rates to help everyone get a rough estimate. After selecting a value for Shocks per minute, any range of stats under the matching line should regenerate more mana with the Glyph of Illumination. We can plot actual or theoretical stats onto any point and quickly determine if the glyph is a good choice. For players prioritizing Spirit, the charts deserves a look if we find ourselves with a lot of Crit or if we wear four piece tier 14 with a lot of lower level gear. Even then, reforging out of Crit is always an option. If the glyph ever becomes a good choice then it is worth auditing logs frequently for cast and crit rates to make sure we continue getting the best deal. Players might choose, instead, to prioritize Crit over Spirit with the goal of boosting output and relying on cheaper spells to extend our mana. Glyph of Illumination would help offset the regen lost from sacrificing Spirit. To justify one build over the other also requires modeling their potential output, which is beyond the scope of this post. I will say sacrificing other stats for Crit makes our output unreliable. We would dread a streak of non-crits making fights harder or even leading to player deaths. The biggest hurdle to using the glyph is the prevalence of Spirit on gear and how well it scales for regen. Upgrades which increase Crit usually also come with Spirit. Unless something changes in the future, the Glyph of Illumination looks like a dead end and a reduction to our mana regeneration in most foreseeable circumstances.